You will want to come back every year to this beautiful, new home in the heart of Old Town on Park Avenue. It is only a 5 minute walk to Main Street or you can take the FREE bus shuttle to everything, including Park City/Canyons Ski Resort, Deer Valley, Main Street, outlet shopping, Olympic Park, Prospect Square, etc. There is a park in the back and a park across the street. You can come home after a long day to a fireplace and a hot tub with a view. You can also enjoy one of the many wonderful restaurants in Park City. There is a king-size bed in the master, a queen in one bedroom, and two sets of bunk beds in the third bedroom. There is a brand new sleeper sofa in the family room and a sleeper sofa in the living room. Linens are included and a fully-equipped kitchen. The heated, two-car garage easily stores your ski equipment. Come and enjoy Park City and all it has to offer. Hi, my name is Connie and I am the owner/operator of PC Boutique Property Management. PC Boutique is a locally operated property management company based in Park City, Utah. I live in Park City and personally oversee all of my clients' properties. At PC Boutique we take pride in our ability to provide truly thorough and individualized care of all of our homes. I live in Park City and love my beautiful mountain town. Our access to world class skiing, hiking, and mountain biking makes this the perfect place to be if you are into the outdoors. I love the fact that I am able to help share the PC experience with the guests that come and visit our homes! Accommodating, Great location, Two thumbs Up! Connie communicated efficiently and provided us with an awesome home for our ski trip. The location is great as it’s a casual walk to the Town Center lifts and just a stones throw from the bus should you decide to take the Free local bus shuttles. We took the bus to Main Street as it’s an uphill and walked the streets home downhill. The dog park out back was really cool to check out especially enjoying the hot tub after a day on the mountain. Park City is such a great town and I would stay here at this home again. Extremely clean and the location is the most convenient. Stayed here with a family of five and there was plenty of room! None of us had one complaint - will definitely be back! We had a awesome stay at this home. It is very up to date and located in a great location in Park City. Close enough to walk almost anywhere. The beds are very comfortable and eneryone was able to get a good night of sleep. The Kitchen is well equipped which made it easy to cook and eat in. We had a group of 9 and the property fit us very well. Perfect place for Park City! Loved this property! 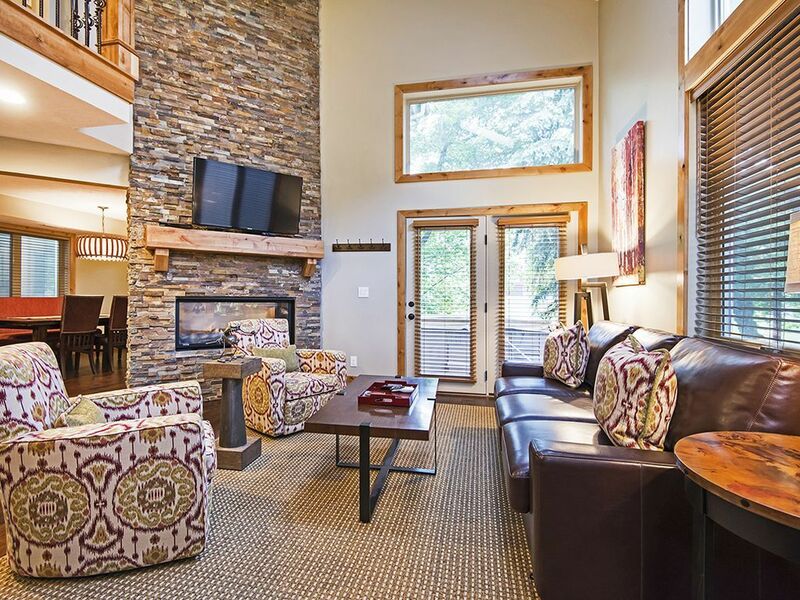 Perfect location for quick walk to the lifts and Park City. Newer house with excellent amenities and comfort. We were a group of 7 guys and fit comfortably. Plenty of sleeping options and space. Look forward to renting again next year! Easy 5-10 min walk to both the base of the mountain and the main part of town. House is very well maintained. The one bedroom with 4 bunks is crowded if you put 4 adults in there. Hot tub is great - overlooks a community park where people would bring their dogs. Very entertaining to watch after a day on the slopes. I stayed here with a group of friends for a ski/boarding trip. The house is perfectly located, only one stop to the lifts, and within easy walking distance of everything. It's also right across from the free shuttle stop. The house is beautiful inside and well maintained. Connie, our host, was very quick to respond to our check in request, and was friendly and polite. Having stayed in our fair share of ski town properties, we were all in agreement that this was our hands down favorite.